After over 20 years experience, we developed the new X Type – a patent pending design that significantly increases grip and reduces bulk that can trigger gagging. As the mouth opens the jaw hinges backward. SeaCure is the only mouthpiece that is shaped for that movement, resulting in the most comfortable bite position. This also reduces leakage and strain in the lower lip area. With SeaCure the “bite stop” is located in the Yellow Sealing Plug. This is important because it is not dependent on the position or the shape of the back teeth. The small bite limiters used by some moldable mouthpieces depend on the shape and position of the back teeth. Unfortunately back teeth are very unpredictable! For example, if a back tooth is missing and the mouthpiece has a bite limiter in the back, this can torque the lower jaw on closure causing asymmetric forces in the jaw joints when diving. We would never want a family member or any diver to risk the possibility of damaging a jaw joint. SeaCure is made from a stiffer material to distribute the leverage of the regulator to the back teeth. Mouthpieces, and especially firmer mouthpieces, tend to tear where the mouthpiece meets the regulator. SeaCure is thicker in this area to eliminate tearing. We don’t want any diver to have a mouthpiece that can tear in this area during a dive. This is dangerous and expensive to replace. SeaCure comes in 5 different sizes since that is the best way to insure a precise fit with the regulator. SeaCure is guaranteed to fit – period! This is not just your standard limited warranty against defects! Because no mouthpiece will fit everyone every time we feel the diver should never be punished if a mouthpiece does not work for them. 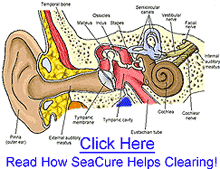 Unlike any other mouthpiece in the marketplace today we guarantee a comfortable fit with SeaCure. You’ll never be sad that you spent the money.